Western North Carolina tends to be quite conservative, but the progressive college and art city of Asheville is a decided exception, with one of the most tight-knit, dynamic, and visible lesbian and gay communities in the South. 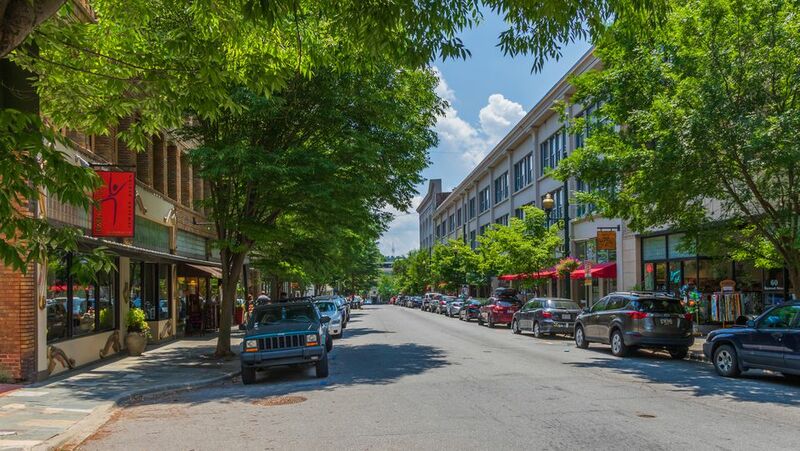 Comprising a hip and funky downtown loaded with galleries, cool restaurants, and splendid art deco buildings, Asheville also abounds with romantic B&Bs and opportunities for hiking and outdoor recreation. For art lovers, shoppers, and fans of old buildings, this is a must, and it also contains a handsomely restored soda fountain, where you can enjoy a light meal or snack to break up the art exploring. This natty Woolworth's building is one of many fine structures in downtown Asheville, including the Grove Arcade, Kress Building, Pearlman's Furniture Building, Public Service Building, and Flatiron Building. Who says you've gotta eat fatty, heavy fare when dining at authentic Southern restaurants? The funky and hip Early Girl Eatery (8 Wall St), smack-dab in the middle of downtown Asheville, pretty much always has a line out the door, because its farm-to-table super-fresh cuisine and quirky ambiance combine for one of the most enjoyable dining experiences in the city. Lesbians and gays flock to this vintage building whose dining room radiates with natural sunlight from breakfast through dinner. Owners John and Julie Stehling work hard not only to prepare high-quality, reasonably priced Southern dishes with plenty of creative twists, they also go to great lengths to support ​local farms and purveyors. Cheerful and sunny Tupelo Honey Cafe (12 College St), in the heart of downtown Asheville, has become almost as legendary for its long lines, especially at breakfast, as its delectable organic-driven Southern fare, but hey, that's not their fault. They simply turn out impeccably delicious, mod-meets-homestyle cooking that locals and visitors can't get enough of. The gay-friendly restaurant has a simple, narrow inside dining room plus a few tables on the sidewalk out front (they're sheltered in winter). A delicious breakfast at Tupelo Honey Cafe might include fresh-baked biscuits with jam and whipped butter, Eggs Crawley (plate of poached eggs, asparagus, and crab cakes topped with homemade hollandaise sauce), sides of local hormone-free sausage and bacon, and Eggs Betty (two poached eggs on a biscuit with ham, homemade hollandaise, and creamy cheese grits). There's superb coffee too. Asheville is an excellent base for exploring the dramatic, mountainous countryside of western North Carolina, including the scenic Blue Ridge Parkway, which cuts through the east side of Asheville, and Great Smoky Mountains National Park, whose North Carolina (Cherokee) entrance lies about an hour west of Asheville via I-40, U.S. 19, and U.S. 441. If the Arts and Crafts movement is something of a religion in Asheville and western North Carolina, the stately Grove Park Inn (290 Macon Ave) is its high temple. The magnificent 1913 hotel was designed by Fred Loring Seely and his famed father-in-law Edwin Wiley Grove, a pharmaceutical magnate initially drawn to Asheville because of its cool, health-inspiring climate. The hotel has seen a dramatic expansion and restoration in recent years, and also has one of the South's most impressive spas, making it a favorite luxury getaway - or simply a must-see for architecture and design buffs. The 510-room hotel sits on the lower western slopes of Sunset Mountain, which is part of North Carolina's Blue Ridge Mountain chain. It's carved right into the hillside, with an entrance you approach from the top, so that the lobby, restaurants, and grand public areas are on the upper floor of the hotel, and rooms tumble down the hillside beneath. At the very bottom is the snazzy Grove Park Spa, and access to the historic golf course designed by legendary designer Donald Ross. From most parts of the hotel, you're treated to views of the golf course and verdant grounds, and from upper floors, you can see downtown Asheville's modest but attractive skyline - plus dramatic sunsets. Even if you don't stay here, at least drop by and have a cocktail in the lobby's Great Hall, with its 14-foot stone fireplaces, or enjoy your beverage on the terrace overlooking the countryside. There are also several fine restaurants to on-site. The Grove Park is one of the city's most famous attractions, so it tends to book up early and because of its extensive facilities and considerable reputation, it draws plenty of families, tour groups, and crowds. At the northeast end of the iconic Grove Arcade, you'll find the stellar (and partly gay-owned) Sante Wine Bar (1 Page Ave), which is actually much more than a place to sip wine - it's an exceptional wine shop, carrying dozens of hard-to-find vintages at extremely fair prices (you can buy a bottle at the retail price and open it up and drink it here). Sante bottles its own signature wines from Sonoma County, and these are a terrific value. But you can also do wines by the glass and flights of a wide range of well-chosen vintages, both New World and Old World - there's a good focus on places like Portugal, New Zealand, Spain, Argentina. The wine menu is enticingly global and fun. The staff is quite knowledgeable and very friendly, too. On a charmingly quiet corner in Biltmore Village, near the grand Biltmore Estate, the aptly named Corner Kitchen (7 All Souls Crescent) occupies a cozy stucco-and-beam house fronted by a redbrick sidewalk and a small green lawn. A number of chain restaurants and shops have popped up in Biltmore Village in recent years, but Corner Kitchen retains a one-of-a-kind, homey air and serves some of the best food in Asheville - maybe even the best in this neighborhood. The Corner Kitchen makes a perfect stop before or after touring Biltmore Estate. The dining takes place in a series of cozy, informal dining areas with hardwood floors, Oriental rugs, and paintings on the walls - it all feels a bit like dining at a good friend's house. Upscale but not unreasonably priced contemporary America fare (with decidedly Southern and Caribbean accents) is served. There's well-thought-out wine list, too. Gay-friendly Asia Spa-Inn (128 Hillside St), which is set on a quiet residential street roughly a 15-minute walk north of downtown Asheville, represents a bit of a departure from the usual B&Bs in the area, which tend toward Arts and Crafts or Victorian. The aesthetic here balances minimalist Far East Asian with Western (suites have names - and related decorative themes - like Java Journey, Paris Flea Market, Silk Route). The adults-only retreat is by definition a B&B, but the sense of serenity, privacy, and artful elegance - plus the fabulous on-site spa treatments - give it more of the feel of a small, upscale spa resort. Rooms have such plush ​amenities and the adjacent spa has a sauna, steam shower, couples massage suite, and a variety of treatments provided by well-trained massage therapists. This is a good choice for a romantic, relaxing getaway, with its serene Japanese-style garden in back, an expansive buffet breakfast included, and first-rate spa facilities. If you're not much for spas and not likely to book spa treatments as part of your stay, this probably isn't the best choice for you - it's really geared toward the full spa/overnight experience. Zambra (85 W. Walnut St) is a lively and sophisticated Spanish tapas restaurant and bar. Scandals is the largest gay nightclub in western North Carolina and a fixture of the Asheville gay scene. Upstairs at the Grove House, which contains Scandals gay nightclub, you'll find a special-events space as well as a quieter bar and lounge called Eleven on Grove, which you can reach by heading up the stairs from the sidebar off of the main dance area. A cousin to the iconic building of the same name and style in New York City, Asheville's Flatiron Building (10 Battery Park Ave) is shorter (eight stories, or about 130 feet, vs NYC's 285-foot Flatiron) and also newer (constructed in 1925, about 23 years after the NYC building). It's nonetheless a prominent landmark in Asheville, and one of downtown's tallest historic structures. Across the street, there's a sculpture of...surprise...a flat iron. Asheville has one of the best collections of noteworthy art deco buildings in the country, many of them having been beautifully preserved and re-adapted to new uses (perhaps most famous is the Grove Arcade). Pictured here is the Pearlman's Furniture Building (now home to Kimmel & Associates, an executive search firm). The three-story, Art Moderne building at 78 Patton Street dates to 1940 and is one of many Deco stunners you'll see around town. The neo-Romanesque Public Service Building skyscraper, which slightly predates true Art Deco, is another notable structure in the city, along with the previous mentioned Asheville Flatiron building. The neoclassical Kress Building, which now contains condos and a crafts gallery, dates to 1928 and is one of Asheville's most celebrated architectural landmarks. The building is just off Pack Square, at 19 Patton Avenue. O'Henry's and the neighboring Underground gay club is the longest-running gay bar in North Carolina. Erected in 1929, just before the Stock Market Crash, and executed with a beautifully ornate terra-cotta exterior, the Public Service Building (89 Patton Ave) is a fine example of neo-Spanish Romanesque design. It's one of the most notable structures in downtown Asheville, which is known for its considerable trove of early 20th-century architecture, making it one of the nation's better small cities for strolling around and gazing at buildings like Pearlman's Furniture Building, Grove Street Arcade, the Kress Building, Flatiron Building and old Woolworth's. Opened by Grove Park Inn founder and pharmaceutical magnate E.W. Grove, the Grove Arcade (1 Page Ave) stands out among downtown Asheville's many striking buildings as arguably the most visually dramatic - the Art Deco beauty was built in 1929 takes up a prime city block. Following a complete restoration in 2002, the three-story market building contains a number of offices, boutiques, restaurants, and residential units within its elegant interior, which features long corridors with soaring atriums and glass-paneled ceilings. It's also a focal point of such popular downtown events as First Friday. Every day at the Battery Park Avenue end of the building, there's an outdoor craft and produce market, called Portico Market, which is a fine place to look for locally made artwork as well as fine regional foods and goodies. Off of this, you'll find the Grove Corner Market, a gourmet-food shop; and the dapper Carmel's Restaurant and Bar. Venture inside the arcade's entrance, and you'll find a number of additional enticing enterprises. Foodies, design buffs, and shoppers shouldn't miss this place! An elegant but informal spot with both indoor and outside (sidewalk) seating at Asheville's famed Grove Arcade, Carmel's Restaurant and Bar is the domain of noted local chef Carole Bowers, whose sophisticated American fare places an emphasis on fresh farm-to-table ingredients and sustainable seafood. The bar here is notable, too, for its impressive selection of beer, wine, and fine cocktails. In warm weather, you can often listen to live jazz as you dine at one of Carmel's outside tables. With its swanky vibe and rarefied cuisine, this is one of Asheville's best restaurants to celebrate a romantic occasion, yet you'll also do fine here wearing nice jeans and a T-shirt.